Hong Kong blog. Original collection of travelposts about Hong Kong. Located in Sheung Wan, Cleverly Street is a wall named street. There you can find forex shops to convert your money in HKD or the other way round. It’s a kind of fierce and direct competition between sellers: don’t hesitate to ask for rates at all the shops in the street and then choose the best one. I found that the rates there were quite good: at a time where 1 EUR = 12.2 HKD on financial markets (i.e. in March 2008), I found rates like 1 EUR = 11.4 HKD at one shop, then another rate around 1 EUR = 11.6 HKD and I ended in a shop where, after negotiation, they accepted the rate of 1 EUR = 12 HKD, i.e. 0.2 HKD below the official forex rate, which is a real tight spread. So if you have currency to exchange, forget about the airport, forget about the busy streets of Causeway Bay or even Mong Kok and come here to Cleverly Street where rates are much better. 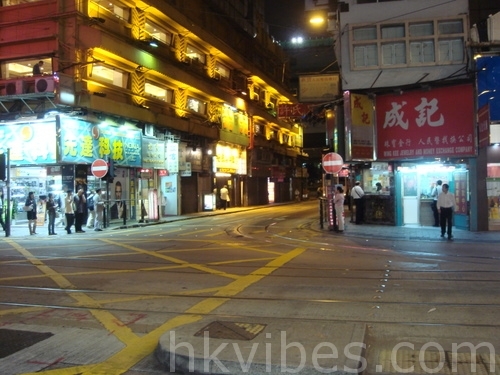 Hkvibes.com is all about sharing ideas, spots and all kind of good stuff about Hong Kong. Do feel free to comment on posts or even ask for guest posting! We would also be pleased to have your feedback on the website: our contact form is only one click away. Major overhaul on the Hong Kong blog! The Olympic Games are coming! mike: It looks great. I love food like that here in New York. Should you want to use some of our content, give us some feedback or let us know about a bug, please feel free to contact us through the contact form.